Sometimes, a disparate crowd of random influences and a handful of scene-makers coalesce out of nothing, and before you know it a movement is happening. So it was in the UK in the early-to-mid-‘80s, when an unlikely set of bands resurrected the spirit of mid-‘60s Garage Rock. Fusing that sound with elements of the pre-Fab Four, Psych, Mod, Rockabilly and Psychobilly, and greasing the wheels of this new machine with a thick slab of post—punk sensibility, bands across the UK began to shout and holler like they hadn’t in years, capturing their work on often rough and ready recordings, issued on Big Beat, Hangman, Hit Records, Media Burn, Creation and other equally fried labels. From London, Medway and the South East to Edinburgh and beyond, the Trash movement spread, quickly reaching out into mainland Europe and beyond. Here in the UK, Trash finally enjoyed its moment in the sunshine in 1984, when four of the scene’s key bands appeared on Channel 4’s flagship music show The Tube. Spiky, brash, loud and unfettered by delusions of grandeur, this is the sound of the post punk UK music scene looking backwards whilst moving forwards. Not for the faint-hearted, sure, and always likely to tell you where you can stick it, but this is a sound that has stuck. The garage and trash scene, albeit under different names and sprinkled with a layer of post-Millennial self-awareness, continues to thrive around the world. Wherever one finds guitars, amplifiers and the primal spirit, one finds Trash. 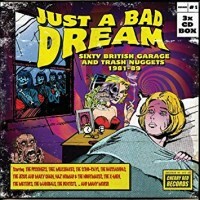 Packed full of rarities and collectibles – the Medway Valley and Billy Childish related material is currently particularly sought after – ‘Just A Bad Dream’ will appeal to fans of ‘80s Psychedelia, Mod Revival, Indie, Psychobilly and, of course, the ‘60s Garage Rock that influenced so many of these artists. Barry says: Clearly influenced by the flood of post-punk and rockabilly acts around the same time, Trash is a scuzzed-up version of garage, often recorded with little to no equipment and with more than an abundance of energy. Here we get the choicest nuggets, all collected on three jam-packed discs for your listening pleasure. Top collection. 12. THE WHOLE WORLD IS TURNING BROUCHARD! – Biff Bang Pow!